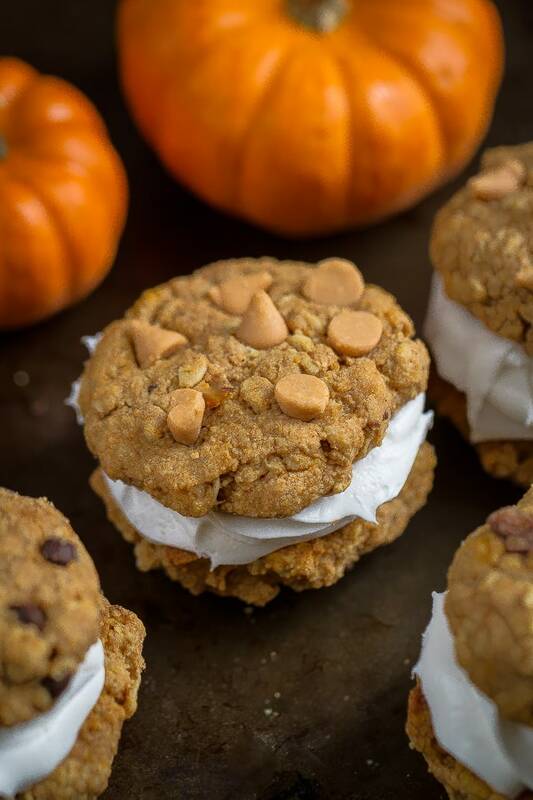 Pumpkin Chip Oatmeal Sandwich Cookies are flourless, soft, chewy and make the perfect gluten free treats. Best of all, they’re stuffed with delicious pumpkin spiced cream cheese frosting. It’s been a cookie-filled week and we’ve been baking up a storm of treats by adding pumpkin into everything. Last week we whipped up a batch of these Flourless Pumpkin Oatmeal Cookie Sandwiches and they’re now my new favorite cookies! They were best straight out of the oven but were so soft and chewy even on the next day. 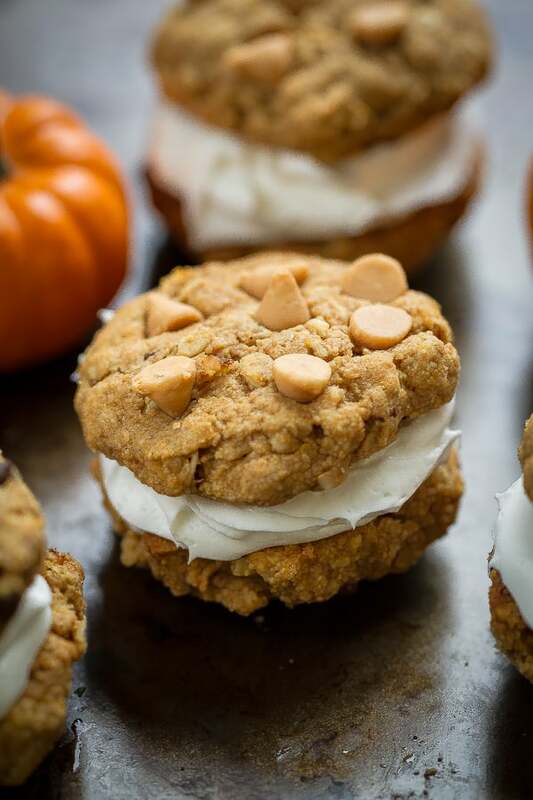 These Pumpkin Chip Oatmeal Sandwich Cookies are packed with triple the pumpkin in every bite. There’s the pumpkin spiced cookie base, pumpkin spice chips and the pumpkin frosting. A total pumpkin fiesta for any pumpkin lover! They’re flourless and made with gluten free oats that I grind up into a fine powder. The cookie dough doesn’t contain any butter or eggs. Instead, we use softened coconut oil, pumpkin puree and a little bit of apple sauce. It helps keep the cookies soft, chewy and thick with slightly crispy edges. 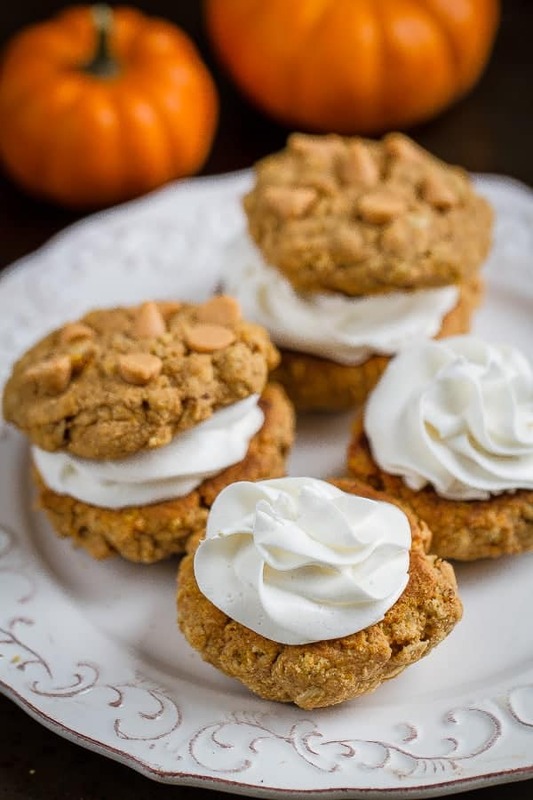 The cookies are sensational on their own but slathering them between the light and creamy pumpkin cream cheese frosting makes them extra special. If you can’t find these pumpkin spice chips from Nestlé®, the cinnamon ones would work beautifully in here. You can also use any other baking chips you’ve got on hand. 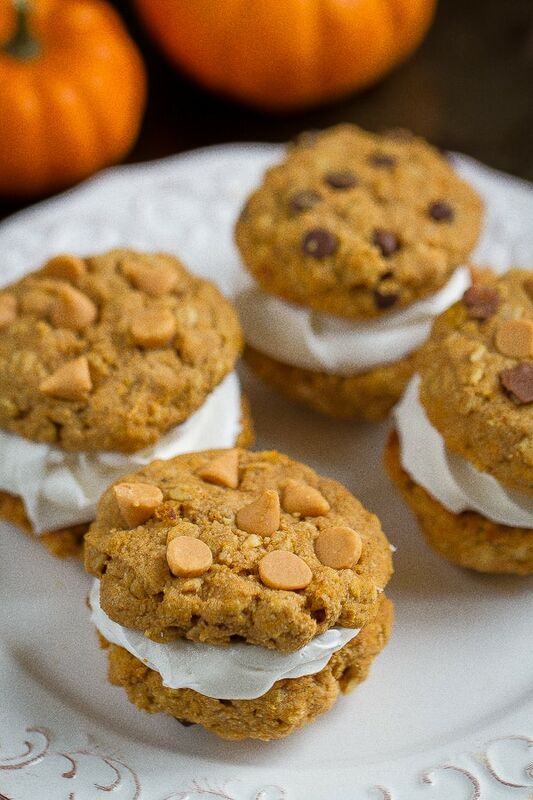 Soft and chewy pumpkin chip oatmeal cookie sandwiches stuffed with pumpkin spiced cream cheese frosting. In a large bowl, whisk together the flour, baking powder, baking soda, salt, cinnamon and pumpkin pie spice. Stir in oats. Set aside. Cream together softened coconut oil, granulated sugar and brown sugar until no lumps are present. Mixture should be gritty. Add vanilla extract, pumpkin and apple sauce mixing until well combined. Pour the wet ingredients into the dry ingredients and mix together with a large spoon or rubber spatula being careful not to over-mix. Fold in the pumpkin spice chips or your favorite chips. The dough will be very soft, so make sure you chill the dough in the refrigerator for at least 15-30 minutes, or covered up to 3 days. Preheat oven to 350 F degrees. Line two large baking sheets with parchment paper or silicone baking mats. Remove dough from refrigerator. Using a medium cookie scoop, measure out 2 tablespoons of dough balls and place on prepared baking pans. Slightly flatten the dough balls with spatula. Top with more chips if desired. Bake the cookies for 13-15 minutes until edges are slightly golden. Be careful not to overbake. Allow the cookies to cool for at least 10 minutes on the cookie sheets before transferring to a wire rack to cool completely. For quicker and best results, chill cookies in the fridge for an hour to help speed up the process and allow the cookies to harden slightly so they are able to hold the frosting. In the bowl of a stand mixer, beat cream cheese for 3 minutes until light and creamy. Add butter and continue beating for another 2 minutes. Add cinnamon, ginger, cloves, nutmeg (or pumpkin pie spice) and vanilla extract and slow add powdered sugar until you reach your desired consistency. Add pumpkin puree and heavy cream and beat until fully incorporated. Add more powdered sugar if needed. Use a small offset spatula or a pastry bag fitted with Wilton tip 1M and add frosting to the bottom of one cookie. Top with another cookie. *To make your own oat flour, grind up rolled oats in a high speed food processor or blender into a fine blend. Bob's Red Mill also sells oat flour which works great in here.